Catching up on a few things first that I made before my trip to China… I never realized how difficult it would be to get back into blogging once you've taken a long break heh. That plus the fact that using dialup internet to upload food photos is just a pain! I've always found homemade pound cakes to be incredibly delicious in a way that no store-bought equivalent could match. And it was those rare moments of delight, when a co-worker or friend brought in a homemade pound cake that made me want to try my own hand at it. I have heard great things about the use of sour cream in pound cakes, so I went in search of a simple sour cream pound cake recipe. 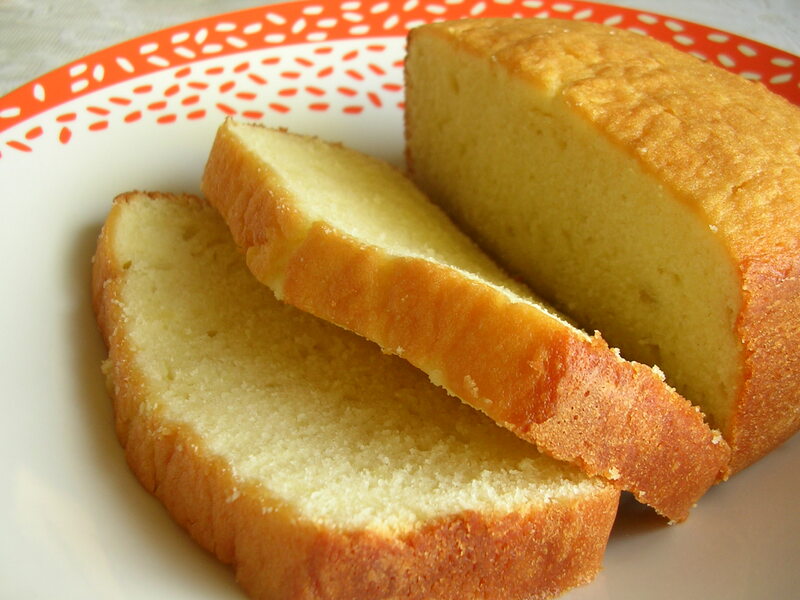 I was looking for a classic, somewhat dense cake that was moist not but greasy, and rich in that buttery vanilla flavor so typical of pound cake. Of course, the recipes I encountered all seemed a bit on the scary side in terms of the amount of butter, sugar, and eggs that were used, so I tried to find a compromise between taste and healthiness. By cutting the butter and sugar, and boosting moistness with extra sour cream, I found the results to be a much less guilty deliciousness :) The texture of the cake was a little lighter than regular pound cake, sort of like a combination of pound cake and angel food cake, yet it was still very moist. But it was the rich vanilla butter flavor that remained that pulled everything together for a satisfying experience. 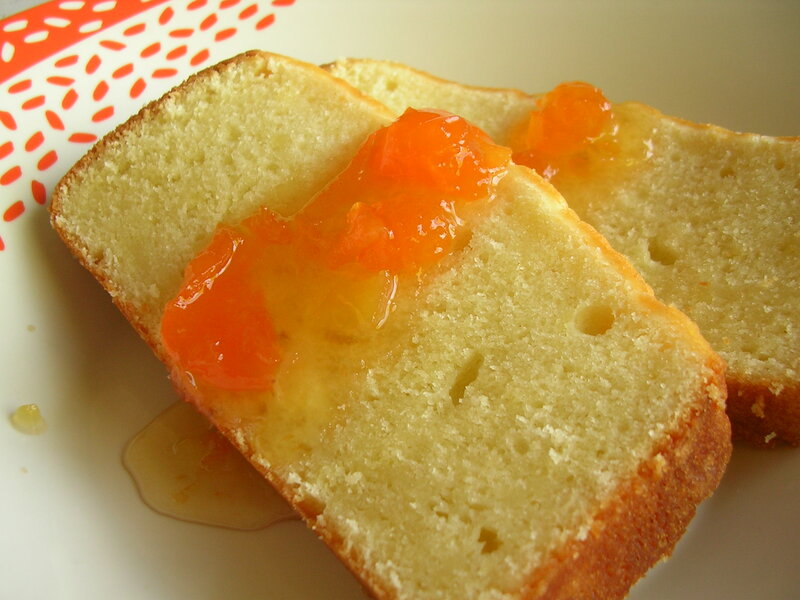 I put together an effortless apricot glaze to go with the pound cake, but I actually found it to be most delicious eaten alone, especially when fresh out of the oven, when the outer crust has a light crunchiness, yielding to a warm and soft melt-in-your-mouth cake inside. Oh, it's making my mouth water just to describe it. The cake is still great after it has cooled off, though you want to keep it sealed to retain the moisture, which thus softens the crust. So choose your own adventure… or have it both ways! 1. Pre-heat oven to 325 degrees F. Grease and flour a 6 inch tube pan. 2. In a large bowl, cream together butter and sugar with an electric mixer until light and smooth, about 7 minutes. Beat in eggs one a a time, mixing for a minute after each addition. Stir in vanilla. 3. Combine flour, baking soda, and salt. Fold dry ingredients into creamed mixture just until smooth. Gently fold in sour cream. Spread batter into baking pan. 4. Bake for 1 hour and 10 minutes in oven. A toothpick poked into the cake should come out mostly clean. Remove from oven and cool cake in the pan for 10 minutes, before inverting gently onto a cooling rack. Dust with powdered sugar before serving if desired. Optionally, make an easy fruit glaze by stirring some fruit preserves with water to reach a glaze consistency, and spoon over slices of pound cake to serve. This entry was posted on Monday, July 28th, 2008 at 7:45 pm	and posted in American, baking, desserts, healthy, recipes, Uncategorized. You can follow any responses to this entry through the RSS 2.0 feed. oooooh… pound cake! and you found a way to cut out some of the butter and sugar (which has always been what kept me from actually indulging in pound cake)… i'm totally going to have to try this recipe out! I read about pinkberry yogurt and did an image search, which led me to your blog.